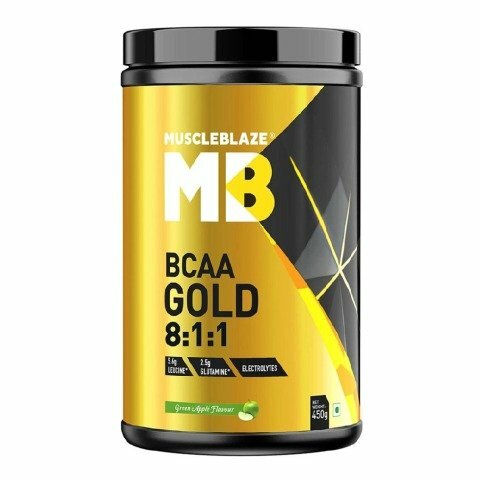 MuscleBlaze BCAA Gold is a breakthrough intra-workout fuel with an 8:1:1 ratio of branched chain amino acids including Leucine, Isoleucine, and Valine respectively. The common BCAA ratio found in regular intra-workout supplements is 2:1:1 with 2 parts of leucine over 1 part each for the other two BCAAs. A higher leucine content in your intra-workout fuel may prove a game changer as it activates the complex muscle building pathways when body undergoes a heavy duty workout. 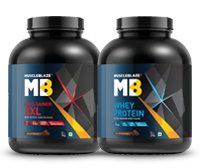 It enhances the synthesis of protein in the muscles thus helping in lean mass gain and faster recovery. MuscleBlaze® BCAA Gold is a superior intra-workout fuel due to its higher leucine content with 5.6g of leucine per serving having an 8:1:1 ratio with Isoleucine and Valine respectively. Leucine is one of the major activators of a complex called mTOR, which ramps up muscle protein synthesis and therefore muscle growth. 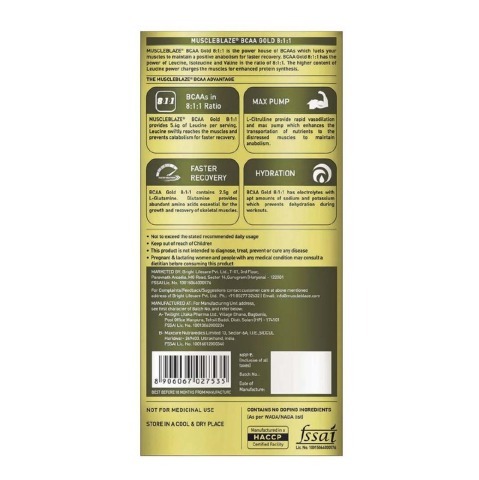 BCAA Gold has sodium and potassium as potent electrolytes. When consumed during the workouts, these electrolytes help keep the vital electrolytes in the body and prevent the onset of fatigue. These electrolytes also help in hydrating the body during strenuous workouts. Glutamine is found as over 61% of amino acid in the skeletal muscles and contains 19% of the nitrogen responsible for the vasodilation of nerves. 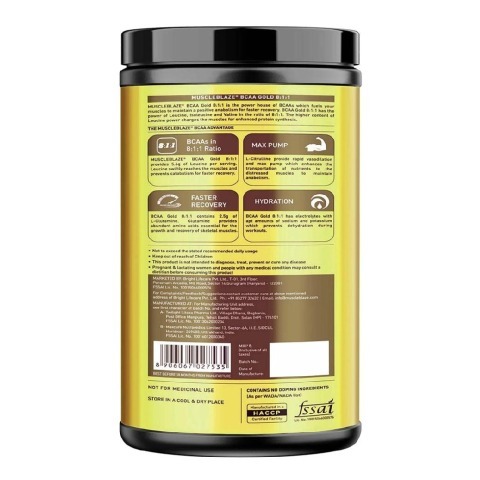 With 2.5g of L-Glutamine, BCAA Gold provides ample amino acids for faster muscle growth and recovery of skeletal muscles which wear and tear during workout. 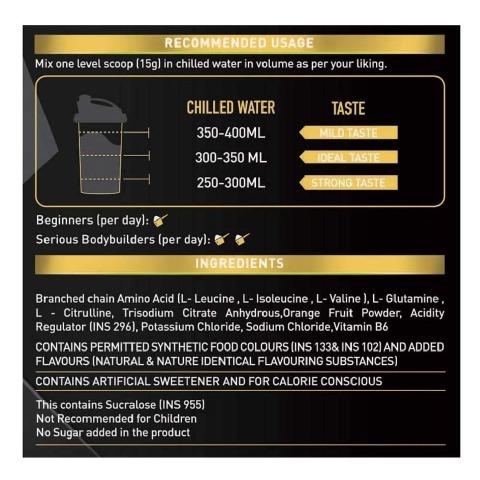 Each serving of BCAA Gold is loaded with L-Citrulline which facilitates vasodilation and pump. It acts a potent precursor to arginine which enhances the transportation of nutrients to the muscles by increased blood flow to the muscles. We deliver only what is best for you thus MuscleBlaze® BCAA Gold is completely free from added sugar to help you gulp down only what is good. BCAAs are the essential amino acids leucine, isoleucine and valine, which comprise around 35-40% of your body’s muscle protein. They’re essential because your body doesn’t make them on its own and hence you must get them from food or workout supplements. Out of the nine essential amino acids, the BCAAs (Leucine, Iso-leucine & Valine) play a crucial role in muscle protein synthesis and recovery. They also help preserve muscle glycogen stores, which fuel your muscles and minimize protein breakdown during exercise. In simple terms, BCAAs can help you get more out of your daily gym sessions. 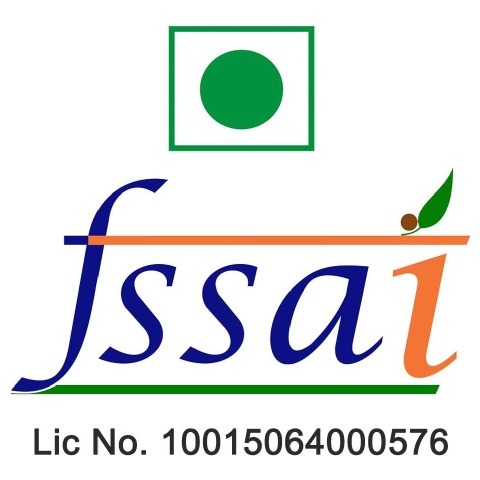 2.Why is an additional BCAA supplement required? Doesn’t protein provide enough BCAAs? BCAAs as a supplement gets absorbed in minutes and as an intra-workout, it gets transported to muscle cells quicker, thereby decreasing muscle breakdown during training. Proteins have BCAAs but they take more time to digest, as a result they are not available to your body when you are working out. Supplementing with BCAAs helps preserve your stores of glycogen—the primary fuel your muscles use for energy production. This means your body has a reliable energy source to tap into while you work out, which can keep you going. 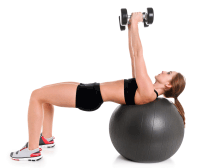 That’s potentially more energy, more reps and more gains. 3.How is BCAA Gold different from other BCAA supplements? 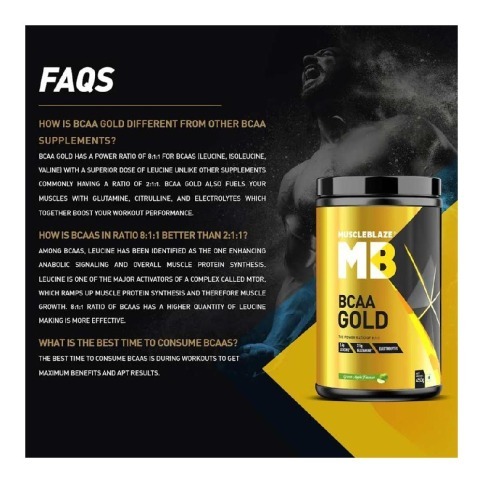 BCAA Gold has a ratio of 8:1:1 for L-Leucine, L-Isoleucine, and L-valine respectively unlike other supplements having a ratio of 2:1:1 for the same amino acids. Leucine has the most crucial role to play amongst the BCAAs and higher leucine content helps speed up muscle protein synthesis and hence muscle growth. 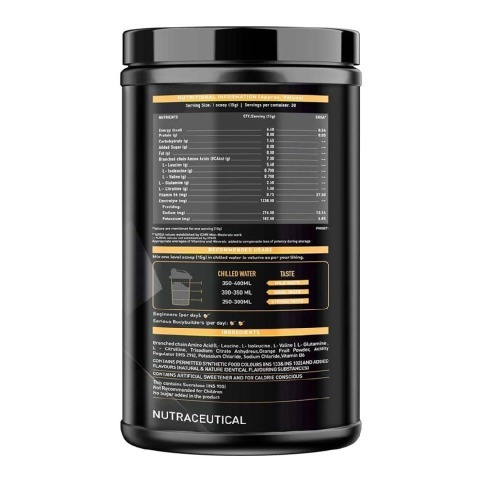 Apart from this, BCAA Gold fuels your muscles with glutamine, citrulline, and electrolytes which together boost your workout performance and elevates the results. 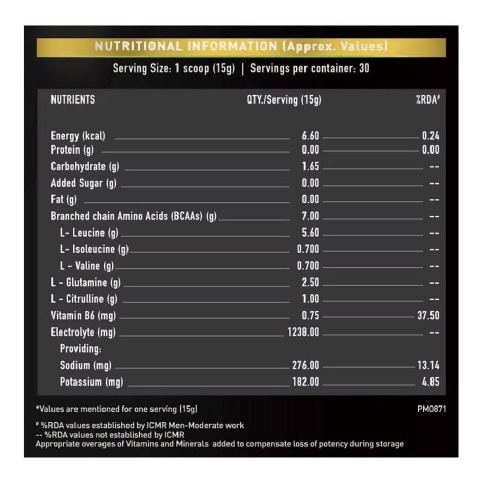 4.How is BCAAs in ratio 8:1:1 better then 2:1:1? Among BCAA'S (Leucine, Isoleucine, Valine), Leucine has been identified as the one enhancing Anabolic Signaling and overall Muscle Protein Synthesis. Current products in the market are most commonly found in the 2:1:1 ratio of BCAAs. However, MuscleBlaze® BCAA Gold has 8:1:1 ratio of BCAAs powered with the goodness of 5.6g of Leucine for faster muscle gains. Leucine is one of the major activators of mTOR. mTOR is like a molecular switch that turns on the machinery that manufactures muscle proteins. 5.What is the best time to consume BCAAs? The best time to consume BCAAs is during workouts to get maximum benefits and apt results.